From Ninth Avenue, you can see the outline of the path extension alongside the Lowe’s construction site. As part of the big home improvement center it is building in Albany, the Lowe’s company is extending the Periwinkle Bike Path all along the eastern boundary of its site. When it’s done, the path will dead-end on Ninth Avenue. And that brings me to a wild idea. It’s not a new idea, actually, and it’s not mine. It was thought about by the college students who helped design the path in the early 1970s, as one of them told me a few years ago. 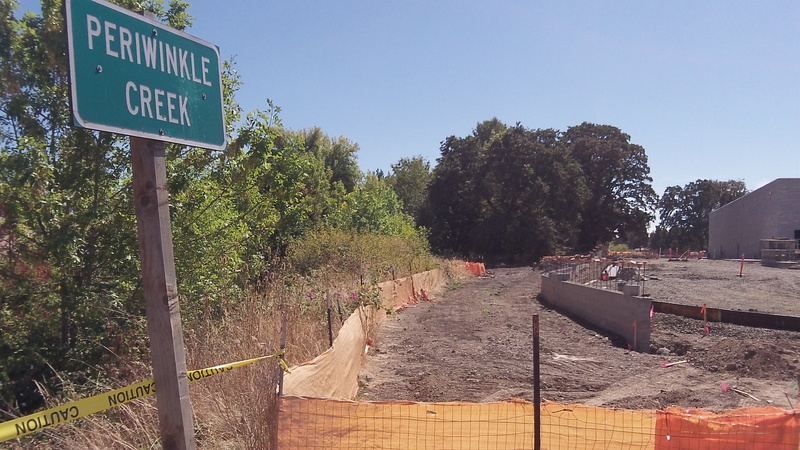 They thought that some day, the path might be extended north along Periwinkle Creek all the way to where it flows into the Willamette River. And why not, you ask? After all, the path follows this channelized creek all the way from Grand Prairie Road to what now is the Lowe’s site before veering west and spitting cyclists out on Oak Street. It would be a formidable task to make this trail reach the river, where it would come out near Bowman Park. It would have to cross eight streets, some heavily trafficked such as Ninth and Pacific, and two sets of railroad tracks. But why “cross” these obstacles? The creek goes UNDER them in a series of culverts. Could a path be squeezed through those tunnels along with the stream? This was done when a concrete path was built along the side of Cox Creek under Pacific Boulevard. But that opening is a lot wider than the Periwinkle culverts. Another challenge is that Periwinkle creek runs in a deep draw with steep sides. Until I took a closer look Thursday afternoon, I didn’t realize how far below the level of the streets the creek actually flows. 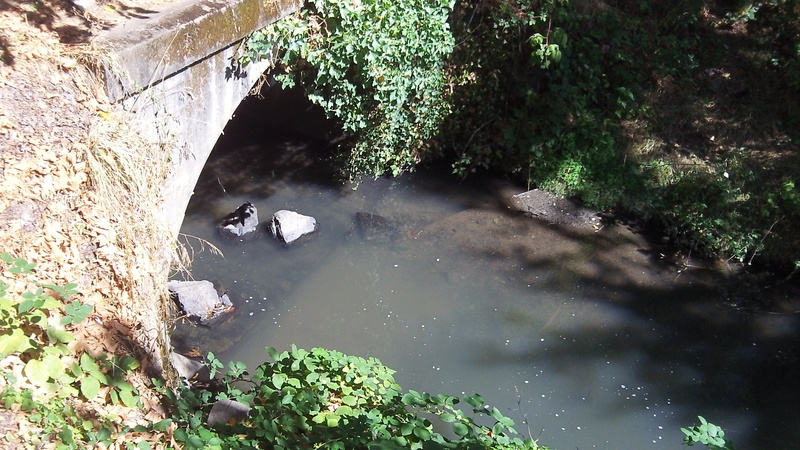 The creek at Santiam Road: Would a path fit under there? If the whole path is too much, how about just the southern half (to Salem Avenue)? That would get you past almost all of the obstacles and ugliness and make a ride all through Albany really pleasant and easy. Clearly a few roundabouts would resolve the issue. No? I think that would be great for Albany to revisit the idea. I would walk during the day and ride my bike almost anytime. Much the way I feel about parts of downtown and Ninth Street and some other areas in Corvallis.